On the evidence of Michy Batshuayi's all-action Bundesliga debut in Borussia Dortmund's 3-2 victory at Cologne, the Belgium striker is going to have no trouble whatsoever filling the boots of the departed Pierre-Emerick Aubameyang. 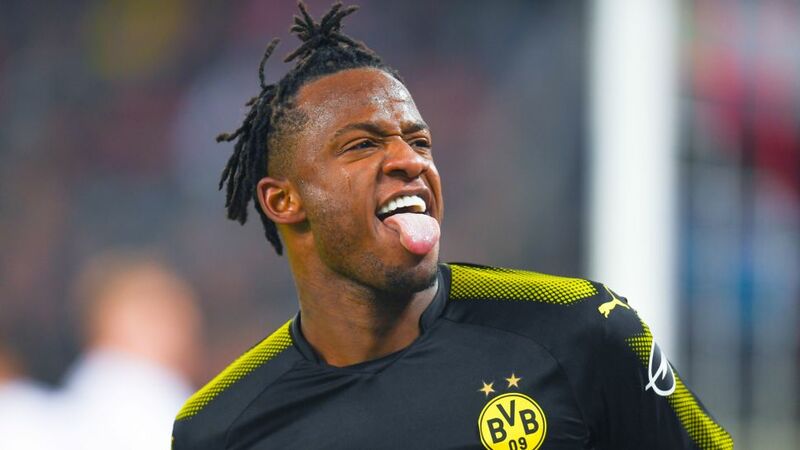 Batshuayi – who arrived at the club on a short-term loan deal from Chelsea as Aubameyang left for Arsenal – scored a brace and supplied the match-winning assist for Andre Schürrle at the RheinEnergieStadion, in a performance that married potent execution with lung-busting effort and unadulterated power. Batshuayi opened his BVB account by clinically sweeping in a Jeremy Toljan cut-back from close range. Although it was the kind of opportunity that his predecessor Aubameyang thrived on, the confidence with which he struck the ball – with his weaker left foot and without looking at Timo Horn's goal – bore all the hallmarks of a natural-born striker, teeming with self-belief. Sure enough, after having a goal ruled out for a narrow offside decision, Batshuayi was on target again in the 62nd minute. His run was timed to perfection and his finish to Christian Pulisic's beautifully weighted through-ball predatory – he even started the move by dispossessing Dominique Heintz on the edge of the Cologne area. Fittingly, in completing his brace, Batshuayi accomplished a feat last seen in August 2013, when Aubameyang celebrated his maiden Bundesliga outing with a hat-trick against Augsburg. His selfless assist – he could just have easily skinned Cologne's last man Jorge Mere rather than release Schürrle on halfway – was the icing on the cake. "We only had our first proper chat just before the game," commented Schürrle, fresh from scoring his first Bundesliga goal in 11 months. "In the warm-up, I asked [Batshuayi] how he likes to receive the ball. Of course, the two goals are really important in terms of his integration into the team and they were key to us getting the win. It couldn't have gone much better for him." Batshuayi's debut numbers bear testimony to Schürrle's glowing appraisal. Dortmund's new No.44 covered 6.7 miles – more than Aubameyang in his final assignment as a BVB player (5.9) – and only bettered by central midfield pair Julian Weigl and Shinji Kagawa and full-backs Lukasz Piszczek and Toljan. In terms of intensive runs – such as the explosive burst that resulted in his second Bundesliga goal – only Pulisic (86) and Mahmoud Dahoud (83) put in more; attacking and defensive midfielders respectively. He also rattled off a match-high seven efforts on goal. "The game went like a dream for him and all involved," said Dortmund head coach Peter Stöger. "We lost an extraordinary forward [in Aubameyang], but on the same day we also got a new player who can score goals. It's great he's settled in so quickly, but I think we all saw that, regardless of the goals, he will be an important player for us." Watch: Batshuayi reflects on a debut to remember! Stöger makes a telling point. While there's no arguing with Aubameyang's goal-scoring record (98 goals in 144 Bundesliga appearances, including a team-leading 13 this season and a Bundesliga-high 31 strikes in 2016/17) he only registered 22 assists in that time. A converted right winger, his game was also built – almost exclusively - around his pace. Batshuayi is an altogether different animal. The 24-year-old scores goals – he has now hit braces in four different top-flight divisions – the Belgian Jupiler League, Ligue 1, the English Premier League and the Bundesliga – and netted five goals in his last four outings in all competitions. He's fleet of foot, selfless, boasts a powerful engine and brings a physical edge to the Dortmund attack not seen since the pre-Aubameyang days of Robert Lewandowski. Put simply, Batshuayi is everything a modern-day striker should be – and Chelsea, by virtue of not inserting an option-to-buy clause into his deal – know it. Whether or not he'll want to leave Dortmund in six months' time is a question for another day, but one thing is certain: life at BVB after the prolific Aubameyang isn’t looking so gloomy, after all.